Children need medical products designed specifically for their unique anatomy and medical needs. Aspen understands this and has worked closely with pediatric nurses to develop solutions that address the needs of these special pediatric patients. The Aspen Pediatric CTO offers the same innovative features as the Aspen Pediatric Collar plus added motion restriction within the cervical and upper thoracic spine. 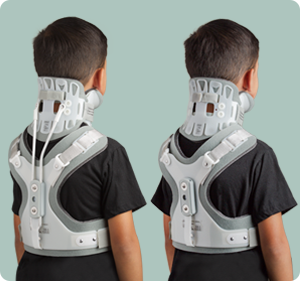 The Aspen Cervicothoracic Bracing System™ provides additional motion restriction of pediatric cervical spine patients. 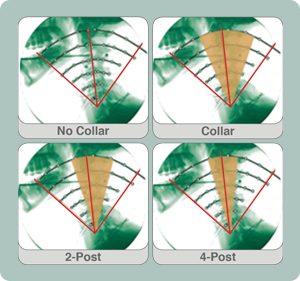 By incorporating design elements that allow the Aspen CTO to be “stepped down” from a 4 post CTO to a 2 post CTO model and then to a stand-alone collar, the degree of motion restriction can be easily tailored to the specific needs of the patient. Utilizing fluoroscopic technology, university researchers and practicing clinicians have quantified cervical motion restriction at each vertebral segment. In data compiled for each of the three different orthotic configurations, numerical results are shown in the table and graphically shown as insets on the photographs. The gold wedges show motion allowed in flexion and extension when moving from the 4 post CTO, to a 2 post CTO, and finally to an Aspen Collar.